When I was 12, my mother was killed in an United Airlines plane crash, leaving by father bereft with six kids ages 5 – 16 to raise alone. At 52, he had just retired a Colonel from the Air Force and was starting a private practice as a physician. He needed to have a way that we kids could get along and learn to treat each other fairly without him always having to resolve disputes. Whoever cuts the cake, gets the last piece. This is a lesson that those in power at SCA need to learn if self-management is to succeed. What’s wrong with the SCA system of “self-management”? First and foremost, SCA is not fair. The big kids (the Board, the GM, and the attorney) are bullying the little kids (owners, residents and dissenting directors) to hog up all the cake that rightly belongs to owners. The Board President is running amuck, consolidating power by controlling who can participate in decision-making by creating Board work groups and blocking owner-oversight committees. The Board President is also misusing his power to disenfranchise political opponents and to silence opposition to the “party line”. By disempowering appropriate owner oversight, executive limitations are poorly defined and internal controls are inadequate to ensure fair and equitable treatment of ALL owners. The Board majority is just going along with the bullying and hogging up the cake “on the advice of counsel”. The GM has been allowed to use the association attorney as her personal attorney (at owners’ expense), and is stealing the Owners’ cake and beating the crap out of the little kids who cry, i.e., owners /residents /board members who complain about non-owners grabbing their cake. 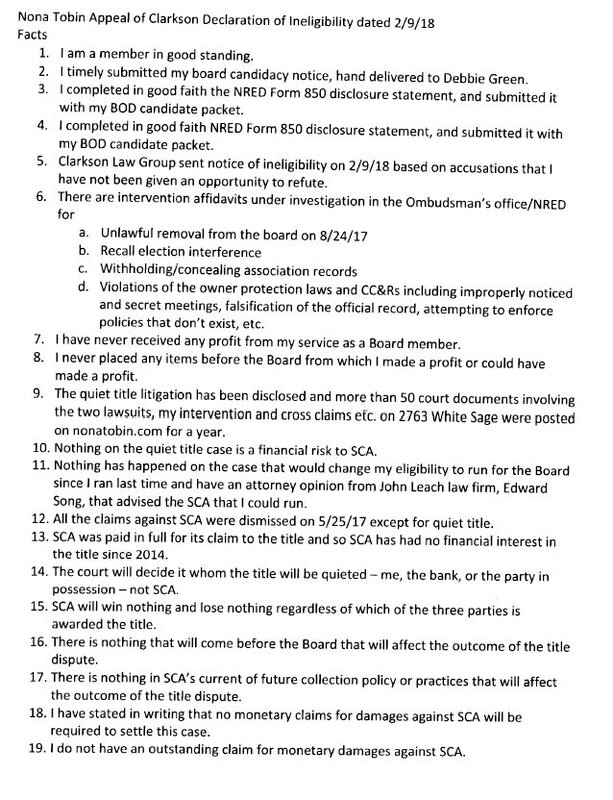 The association attorney has shoved a very big piece of the SCA Owners’ cake into his own mouth and grabbed another big piece for the GM while waving the knife threateningly at owners who even look at the cake, let alone try to get their fair share. Here are some examples of problems with the implementation of self-management caused by the Board’s enabling the GM’s resistance to appropriate owner oversight. Owners pay for everything, but can be blocked from even knowing what they are paying for or how much they are paying. There is no way to control excessive executive compensation. 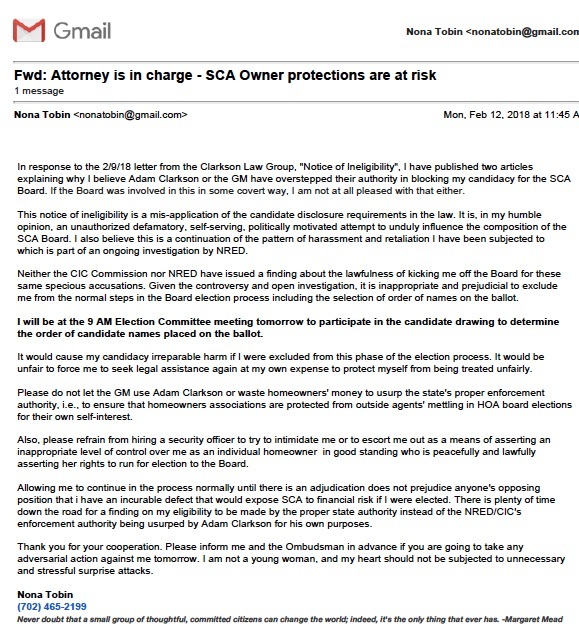 The Board can act in ways that create liability or don’t protect SCA against manageable risks and the owners just have to shut up and pay for it. There is no way to hold the Board, the GM, and the attorney accountable as fiduciaries or to prevent them from abusing their positions for their own profit or personal or political power. Owners can be unfairly treated without being afforded the due process required by law. The SYSTEM must build in controls so it is fair no matter who is in charge. SCA does not have a system in place that protects owners from the very people who are supposed to be acting only for us. If the interests of owners are adverse to those the GM or the Board President, then there is NOTHING built into SCA’s version of self-management to ensure that the owners’ interests will prevail. In fact, with Adam Clarkson and Sandy Seddon calling the shots, there is no owner-protection system in place at all. My granddaughter is six now, but a while ago, she loved knock-knock jokes. Her favorite one was apropos of the SCA Board race. And yet, here I am. In Hawaii, but still knocking my head against the wall, trying to keep the SCA Board composition from being so blatantly manipulated. I know no one will listen. I know that the sides have already been chosen. Lines have been drawn in the sand. Positions are entrenched. It’s pointless. 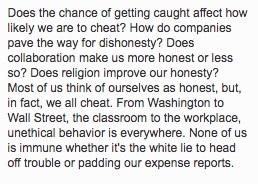 But I am still just OCD enough to need to put these points on the record – where they are out of reach of those who are distorting or concealing the official record for their own purposes. What happened to the two that applied but whose names were not released, but were just gone at the same time I was declared ineligible? Why did Vickie Lisotto drop out? Why didn’t more people apply who have voiced concerns about how self-management is being implemented without owners’ coming first? Fear of facing a recall petition? Candidates Bob Burch and Aletta Waterhouse were themselves both subjects of the petitions signed by over 800 owners to remove them from the Board, but they decided to run again for another two-year term. Amazing that over 800 owners signed petitions over a few Summer weeks to call for an election to remove Aletta Waterhouse and Bob Burch from the Board, but that did not deter them from running again. Even more amazing. They were seemingly so untouched by the list of grievances in the petitions that they did not even deem those 800 owners’ complaints were worthy of being investigated or, if verified, addressed on their merits. Not so amazing since they were completely secure in the fully-funded support of the GM and the attorney, they did not see any irony in how six directors voted in secret to remove me from my Board seat when ZERO owners signed a petition to call for my removal. Did owners decide not to run because they saw what happened to a director that spoke her own mind? From my perspective, the answer is obvious. All the stops will be pulled out to protect a director who has closed ranks to march lockstep with the other Stepford directors to parrot the party line. Step out of line, and you will be threatened. Privately berated and shunned. Publicly humiliated. Then you will be disappeared. No amount of owners’ money is too much to spend to force compliance to the party line. No rule of law. Total hard ball. Would anyone bet a homeowner advocate could be effective on the SCA Board? It is not a safe bet. Not when six of the seven directors apparently can just secretly vote a dissident voice off the island. No trial. No finding. No process. No owner vote. Just goodbye. Can’t run again. Disappeared. Not when Sun City Anthem has a blogger in Hedda Hopper’s McCarthy-era role to maintain a Black List. …(to) actively oppose the election of any candidate who was tied to, or supported, the removal campaign. Ask yourself…who’s spending owners’ money to control who sits on the Board? 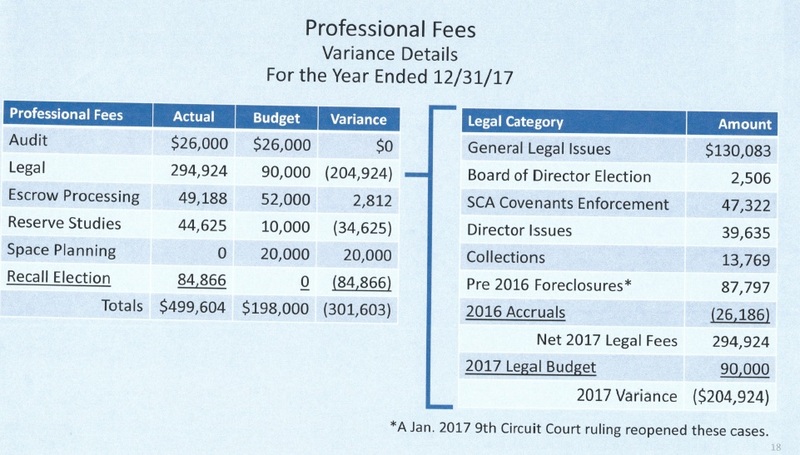 Would Sandy Seddon have sicced attorney Adam Clarkson on a director who supported her getting paid double the market and wasn’t questioning her paying the CFO and Facilities Manager salaries that were also double the market rate? Would President Rex Weddle have turned a blind eye to the GM using the attorney to authorize the expenditure of $90,000 to ensure that the recall election would fail and $40,000 – a combined $130,000 — to ensure that my removal by secret vote would succeed if our positions had been reversed? Would he had let a dime of owners’ money be spent on the recall election if I, and not he, had been the subject of a recall petition? How much would he have authorized expending of owners’ money to pay the attorney to remove him if it were he, and not I, being falsely accused of making a profit from sitting on the Board? Would attorney Adam Clarkson have assisted the GM to make a bogus threat of litigation against SCA, and a director individually, if they weren’t trying to silence that director who was questioning the legitimacy of both their actions while requesting information needed to make fully informed decisions? $90,000 to conduct the removal election which was solely caused by his and the GM’s decision to disempower the volunteer Election Committee? I’m sorry. We weren’t so lucky after all. I have to take back what I said about the restaurant. I can’t recommend any one of the three bidders. The process being used was so flawed that it virtually guarantees the same failures as SCA earned in the past. To use an SNL metaphor, trusting the GM to get this right is like trusting Stevie Wonder to do my grandson’s bris. There’s no point in even giving you a summary of Tom Nissen’s and Forrest Quinn’s reports – even though they tried really, really hard, and they did a lot of fine work. It was just the wrong job, and doing it that way hijacked their job as Board members. And worse, by them doing the wrong job, it makes it impossible for the Board as a whole to do its job right. Remind me, what is the Board’s job? 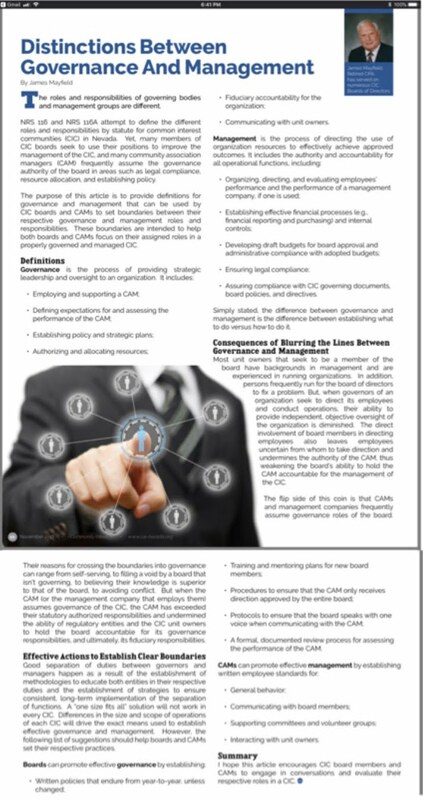 The Board, working as a unit, sets policy, gives direction and defines financial limits and rules to control the GM. The GM then must design and manage the process for getting done what the Board, as a single entity, told her to do. The Board must hold the GM accountable to get the job done right, not let her pick a few Board members to do her work or let her keep secret what she’s doing. That’s why she gets the big, big, big bucks. To my way of thinking, she has a long way to go to prove that she’s worth it to the owners she is here to serve. It’s really, really hard. After all, at the end of the day, some owners are just whiners. using a volunteer owner-oversight committee to guide a fair and open process and monitor her use of appropriate experts and/or neutral brokers. It makes me so sad I want a drink, and there’s no bar. Really, it breaks my heart. I still really want a restaurant. Well, actually, I mostly want a great big, long bar with a great, long happy hour, but there are just way, way too many things wrong with the process to even consider proceeding to choose a vendor from this highly selective RFP. There was too much done without the right people being involved and too much info given to the wrong people. Two Board members were doing the wrong job so they couldn’t do the right one. The GM wasn’t doing her job right. On the bright side, this is a very valuable lesson. The fatal flaws in this restaurant selection process are the same leadership failures and systemic deficiencies that will doom the viability of self-management, if we let it. But having identified the poison pills, we just need to pay attention. We don’t have to swallow them any more. And, if we do, as SCA’s attorney advises, it’ll be our own fault. What do poison pills look like? Author nonatobinPosted on February 27, 2018 February 27, 2018 Categories BOD, Communications, Community division, GM, Governance, Restaurant, Unfair BOD actions7 Comments on I’m sorry. We weren’t so lucky after all. What’s being human got to do with it? I don’t know if anybody clicked on the links to psychological studies in my last blog about the 2/13 Election Committee’s hostile reaction to my appeal of my unfairly being excluded from the 2018 election process. But let’s assume nobody did. Anyway, here’s the point. These important psychological studies contributed to our understanding of how people conform to roles or how people tend to obey authority figures even if they hurt innocent people. This research contains valuable lessons that we all need to learn– but these are particularly important lessons for those in SCA power positions — if we are ever going to heal our community divide. My goal is to encourage people in our community to re-frame the way we approach conflict resolution. None of us can be trusted to be completely objective and completely rational 100% of the time so we need to have a fair and objective governance system that’s strong enough to make sure those in power don’t abuse it. Those in power can’t be allowed to run roughshod over anyone more vulnerable for any reason. And the only way to guarantee that is to have a system that won’t let them get away with it. We are wasting our limited time, money and emotional resources on attorneys who cannot fix what is wrong, and who are, in my view, a big part of the problem. The Milgram experiment (1961) was designed to test how readily people acquiesce to authority even when it is in conflict with personal conscience. The goal was try to understand why so many “good Germans” just went along with Hitler’s horrific actions. “Ordinary people are likely to follow orders given by an authority figure, even to the extent of killing an innocent human being. Obedience to authority is ingrained in us all from the way we are brought up. This Milgram study concluded that people obey authority figures even if it hurts innocent people. This can easily be applied to what happens here in SCA, given that we are all humans. How could we use this knowledge? So, to me personally, giving more power or “authority” to a small group of people is not the answer. The answer is having a governance system that will control those who have the power to prevent them from abusing it. And to have a system that requires the uniform application of the rules to everyone to ensure that ALL owners are protected from any form of abuse, regardless of who is in power. Stanford Prison experiment (1971) demonstrated how quickly people adapt to their assigned roles. Students randomly assigned to be the guards began acting aggressive and authoritarian and rapidly began feeling justified in being abusive while those randomly assigned to being prisoners took on so much of the fear and agony of prisoners subjected to abuse that the experiments were stopped for ethical considerations. Today’s Communication workshop and yesterday’s Board meeting yielded some examples of how people conform to their roles, respond to authority, and conform to norms that are placed upon them that I will discuss in a future blog. Right now, I just want to recommend a book to anyone who would like to explore a little further how we as humans behave irrationally and how we need to have strong social norms and systems in place to protect us from ourselves and the limitations we have from just being human. How could this book help SCA leaders grow into their roles? 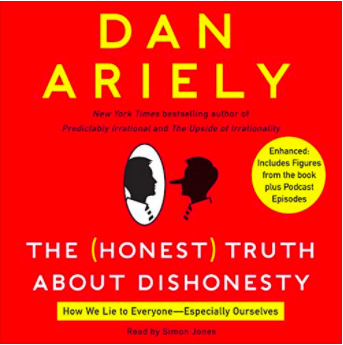 I think Dan Ariely’s entertaining and informative writings (and other research I will suggest later) could teach us concepts and skills that we could use to help ourselves and to resolve some of our SCA community’s deepest divides. how much our expectations can influence what we see, feel, or can learn. It might encourage those in power to be more open to handling conflict in a more constructive way that might prevent exacerbating problems until court is the only answer. Refusing to openly discuss and fairly resolve owners’ concerns “on the advice of counsel” creates a litigious environment in which only the attorneys profit. The price ALL owners pay is much larger than just the attorney fees. We pay for it with our most valuable resources: peace of mind and sense of belonging and joie de vivre. Author nonatobinPosted on February 23, 2018 February 23, 2018 Categories Community division, Ethics, Governance, Take Action, Uncategorized4 Comments on What’s being human got to do with it? Today’s SCA Election Committee meeting was an important part of the SCA Board election process because it was the official start of the election process where candidates drew lots for their ballot position. What could it hurt if I drew a lot until the proper authority rules on my eligibility to serve? Instead of considering the rejection of my candidacy for the Board as final, why not just treat me like any other neighborhood volunteer – at least until there was one iota of proof that I really was worthy of such vilification? What happened went I went looking for justice? I gave the Board and management notice that I was appealing the 2/9/18 Notice of Ineligibility that the Clarkson Law Group had whipped up on SCA owners’ dime to make sure that someone who had the support of at least 2,000 owners was blocked from even being a candidate. In the prior notice, I asked for them not to use the attorney or security to threaten or humiliate me. They accommodated me only insofar as owners didn’t pay for an outside agent to ensure that I was relegated to pariah status. But then, they knew full well, they didn’t need to bring in the heavy-weights, the Election Committee – dutifully, sternly, and totally predictably stepped up to take on the enforcer role. The Officials act official, or was it officious? Before the meeting, I went to the EC chair, Carol Steibel, and told her that I was appealing the attorney’s decision to deem me ineligible and that I wanted to draw for a ballot number so I could stay on equal footing in the election process until a determination on my eligibility was made by proper authority (NRED). “How could you have? I just wrote it this morning.” said I. When I sat at the table, two members of the committee told me sternly to get away from the table. Only candidates could sit there. Carol somberly started the meeting by saying that the meeting would not be recorded and that no one was allowed to record it as it was against the law. The thing about this edict that totally chaps my hide is a major owner protection to allow recordings so, to be ornery I guess, I said I was going to record it. Their reaction was intense. Forrest Quinn joined in saying that he did not authorize recording him. further solidifying the ‘Us vs. Them Her’ dynamic permeating the room. Carol very formally read a notice from the attorney about my situation. She would brook no argument. It was FINAL! 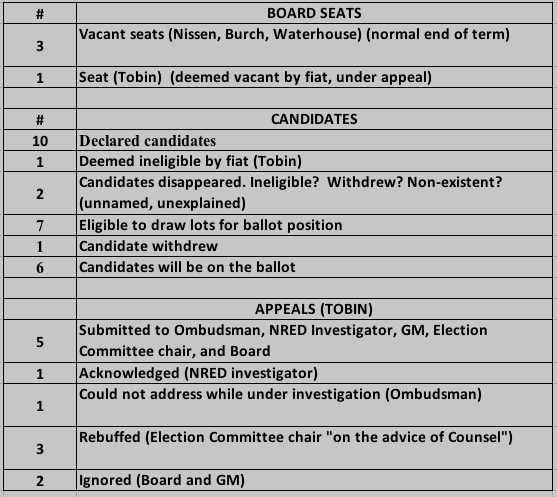 The Board deemed Nona Tobin’s Board position vacant by law making her ineligible to be on the Board. Nona herself made the charges public. No circumstances have changed that would make her eligible. Clarkson law office was merely asked to inform Nona since the Board’s decision that was ineligible has not changed. My, my, my…what an awful person that Nona is! An existential threat. Carol’s tone made it totally clear that questioning the veracity or authority of the attorney would be considered treason, the concept of “Innocent until proven guilty” totally shrouded by her blind spot. P.S. None of the above statements from the attorney that Carol reported are true. I’ll be handing the documents over to NRED to prove it as soon as I can. 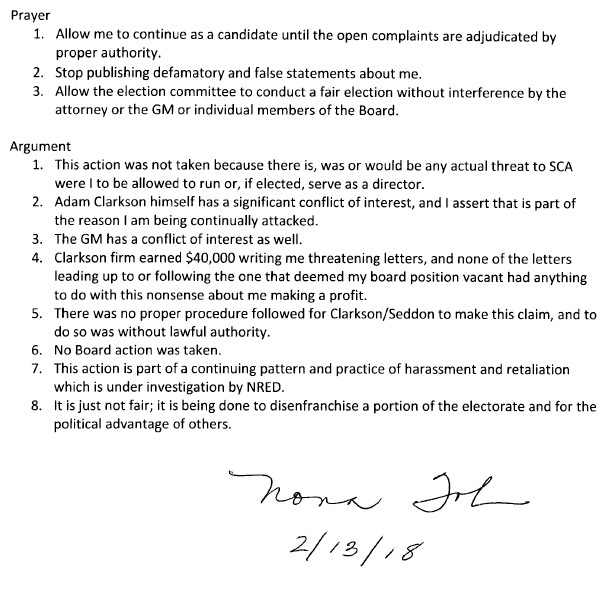 Carol was so busy genuflecting before Clarkson’s awesomeness that she might have forgotten for the teensyist second that as the Election Committee Chairperson, her primary job is to protect the integrity of the election process, to ensure the election is free from undue interference and to protect ANY owner from being disenfranchised. Maybe a little training? I suggest training should come from NRED or any competent, independent professional, but absolutely not conducted by Adam Clarkson. Gary Lee, Board candidate new to the scene, innocently asked for a better explanation why I was dumped, but Carol was adamant that she had said all that needed to be said on the subject, and that he was holding up the very, very important business of the committee. Quick note about # 4 above, it should read that in addition to the NRED form 850, I also submitted the disclosure form as edited by the attorneys even though it was not legally-mandated for me to do so. Would my actions make sense if I were on the Board to make a profit? What does my being on the Board have to do with what the court does about the house? The Board doesn’t have anything to say about it. But, for the sake of argument, let’s say the Board could vote on something related to the outcome of the title fight. If my ulterior motive was to get the Board to vote to quiet title to me instead of the bank, wouldn’t I have tried a different approach? If I were trying to get a Board vote on litigation I could profit from, wouldn’t I have been smarter to ingratiate myself and “go along to get along”. Wouldn’t I have been foolish to risk the ire of the Board to protect the right of owners to legally sign petitions to call for a vote to remove directors from the Board? Would I have pursued formal complaints to enforcement authorities saying that the attorney and the GM should be fired for causing the Board to act unlawfully? Isn’t it more likely that the same over-compensated GM and attorney, after protecting compliant directors in power from a removal election, just created a convenient ruse to bypass owners’ votes and remove the thorn in their side and block me from coming back? I’ll be there despite Clarkson’s challenge to my eligibility. I have requested that I be treated as a candidate unless a State of Nevada official with proper legal authority rules that I am not eligible to be a candidate. As you can see in the email below (which I sent to the SCA Board, the GM, the Ombudsman, the NRED investigator and others), I have requested, in respect for my advanced age and frail heart, that I not be treated unfairly or be subjected to a hostile surprise attack, be escorted from the room or face any other bullying or humiliation because I have the temerity to insist on my right to volunteer to serve as a member of the Board. I encourage you to come if you are interested in ensuring that SCA is not the kind of place where a homeowner in good standing, acting in good faith, can be treated shabbily for simply trying to be of service. Remember, this is not about me. This is about having a system of governance that is fair, open and protects ALL homeowners equally – no matter who is in charge. 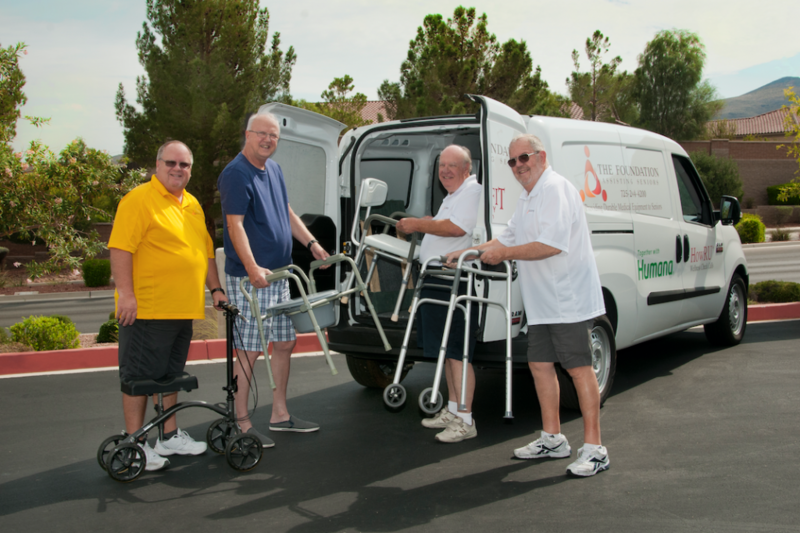 HENDERSON, Nev. — Established in 2002, the Foundation Assisting Seniors is proud to announce its new location at 2518 Anthem Village Dr., Ste. 102, in Henderson, Nev. The Foundation provides essential programs and services including light home maintenance and durable medical equipment, as well as the HowRU™ program and the Medication Reminder program at no cost.